You are currently browsing the archives for the Zach Dorholt category. Zach Dorholt’s newest political venture is running for the ISD 742 School Board. Predictably, Dorholt is bringing his failed liberal ideology with him. Actually, St. Cloud doesn’t need 2 high schools, especially with grade school enrollments dropping over the next 10 years. The new Tech High School should be able to house all of the students within a decade. The last thing we need is to spend another $25,000,000-$50,000,000 on renovating Apollo. Dorholt will have high name recognition going for him in his campaign. What he’ll have going against him is his reckless spending habits, his love of tax increases and his liberal ideology of just dumping tons of money at noisemakers. People who have studied the Apollo issue and who are honest know that we don’t need to renovate the building. Dorholt and his fellow liberal won’t admit it but St. Cloud isn’t growing. Businesses are closing or moving. People who still live in St. Cloud are sending their kids to Sauk Rapids-Rice HS so they won’t have to deal with the Tech situation. Meanwhile, Dorholt and his progressive friends have buried their heads in the sand, pretending that the problems I just outlined don’t exist. Unfortunately for taxpayers, they exist. Dorholt and the other progressives on the Board will attempt to throw more money at the problem without fixing the problem. This morning, I paid a quick visit to Zach Dorholt’s priorities page to see what Tina Flint-Smith Alida Messenger told him he believes. Earlier this week, at the St. Cloud Times-sponsored candidate forum, Dorholt said that he’d support a single-payer health care system. That was startling news to most of his constituents. First, it’s noteworthy that Dorholt is an ideologue first. It’s incidental that he works “in the health care field.” Further, it’s noteworthy that working in the health care field doesn’t automatically make you an expert on health care policy. That isn’t to say we shouldn’t have health care professionals on the MNsure board. I’m just arguing that we shouldn’t just pick someone for the board because they work in the health care industry. It’s worth noting that Gov. Dayton initially said that the Affordable Care Act wasn’t affordable 2 weeks ago. This week, he’s written an op-ed saying things aren’t so bad. I’m betting that Hillary’s campaign called him and lectured him on saying something like that. Finally, Dorholt can’t admit that the system Minnesota had prior to Obamacare/MNsure, complete with its high-risk pool, did a fantastic job insuring people with pre-existing conditions while keeping health insurance premiums for healthy people relatively stable. I’ve said this before and I’ll repeat it here: the federal government should’ve modeled their plan after Minnesota’s system. Unfortunately for Minnesota, our senators crumpled like spineless wimps and voted to destroy Minnesota’s system. Warren Bradbury’s LTE highlights the fact that the DFL thinks voters are stupid. Bradbury said that “There was no stalemate on funding vital transportation programs.” That’s technically true because the DFL legislature totally ignored transportation issues when they controlled the legislature. The DFL ignored transportation issues because they were too busy passing a bill to build a $90,000,000 office building for fat-cat politicians. The DFL ignored transportation issues because they were too busy imposing tax increases on farmers and businesses with warehouse operations. The DFL ignored transportation issues because they were too busy shoving unionization down the throats of in-home child care providers. Then-Rep. Dorholt voted for each of those things in his first year. In his second year, after getting blistered by his constituents for his votes on raising taxes, he voted to repeal the tax increases he voted for in his first year. 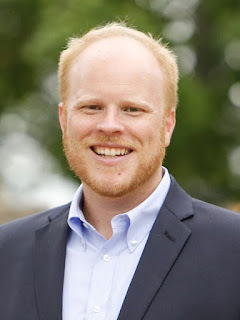 Zach has worked diligently for the people of this legislative district, and, with your help, we can return him to finish this good work, and continue to move our state forward. Zach has worked diligently for the union special interests. He ignored in-home child care providers who opposed forced unionization, instead siding with the unions that contribute thousands of dollars to his campaigns. Of course, Dorholt isn’t telling the truth about this. 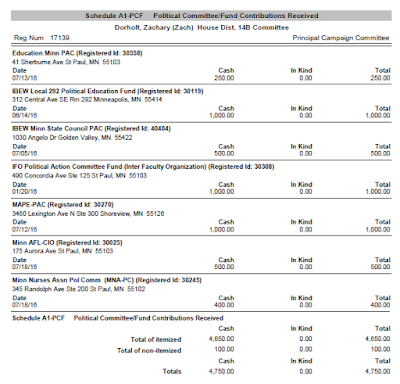 He’s bought and paid for by the DFL’s special interests. When he was in the legislature in 2013-14, Rep. Dorholt voted for the forced unionization of in-home child care providers even though they wanted nothing to do with the AFSCME union. These in-home child care providers proved they didn’t want the union by soundly rejecting unionization by a vote of 1,014-392 this past March. That’s a 72%-28% rejection. 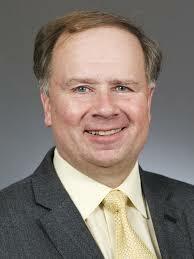 I won’t trust these DFL politicians with health care. They’re the idiots that ruined Minnesota’s already-functioning health care system. Why trust them to fix a system that needs a transformation? Wolgamott and Dorholt aren’t transformational people. They’re agents for the DFL’s status quo. They’ll do whatever Rep. Thissen and Sen. Bakk tell them to do. 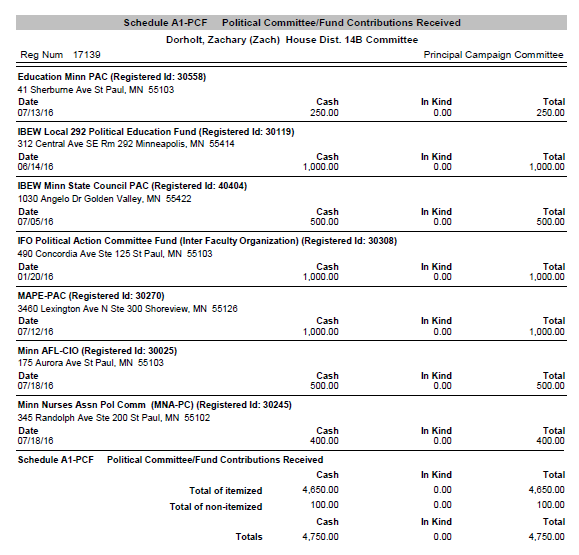 Further, these DFL candidates won’t fight for roads and bridges funding. They’ll fight for light rail transit, which is a total waste of money. 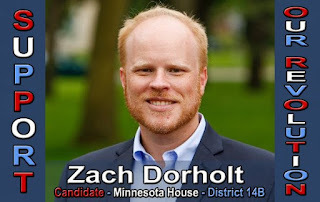 I won’t pretend that Zach Dorholt loves the Constitution. He doesn’t. That isn’t surprising considering the fact that he’s a progressive. Progressives, whether we’re talking about President Obama, Mrs. Clinton, Rick Nolan or Zach Dorholt, prefer limiting speech. Specifically, they prefer limiting speech that’s critical of them. This LTE highlights the DFL’s pathetic arguments for limiting political speech. My initial reaction is that the fascist that wrote this LTE is a whiny liberal who can’t take criticism. I get as many mailers as anyone in St. Cloud. I’ll admit that they’re annoying at times. I’ll argue, though, that I prefer getting annoyed vs. the thought of other people’s opinions not getting expressed. IMPORTANT TAKEAWAY: I’ll fight for everyone’s right to express their opinions, even if I vehemently disagree with their opinions. where businesses are competitive and innovation is encouraged. where the permitting process is streamlined and compliance review is straightforward. where workers are protected in and out of the workplace and receive livable wages. where companies are rewarded for keeping jobs from going overseas. Mr. Dorholt, how can you be for streamlining the permitting process for PolyMet, then say that we need more regulations to protect workers and mandate “livable wages”? The DFL has an agenda. It’s an agenda of killing middle class jobs, raising taxes on everyone via the gas tax and funding the Southwest Light Rail project that does nothing to reduce congestion on Twin Cities highways. They just can’t talk about that agenda. That’s why they’re stuck talking about limiting people’s First Amendment rights and violating our constitutional rights.